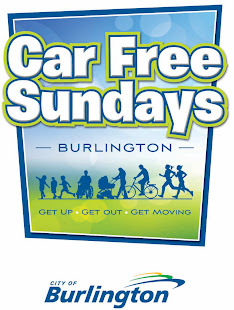 i bike burlington: "Forget all the other reasons you should be riding a bike. This is the one that matters"
"Forget all the other reasons you should be riding a bike. This is the one that matters"
Data from 263,450 participants - it's a meaningful number. "This British study took a comprehensive look at the health benefits of bicycle commuting, and the results are staggering. Over the course of the study, the 263,450 subjects who were under review had a 41 per cent lower chance of death than those who didn’t. “Cycle commuters had a 52 per cent lower risk of dying from heart disease and a 40 per cent lower risk of dying from cancer. They also had 46 per cent lower risk of developing heart disease and a 45 per cent lower risk of developing cancer at all,” the study’s authors wrote." 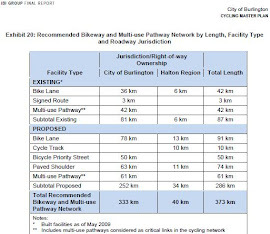 So why don't we have protected bike lanes in Burlington? Registration is now open for the 12th Annual Greg's Ride! Hamilton on September 24, 2017. Coming this summer to Burlington!! 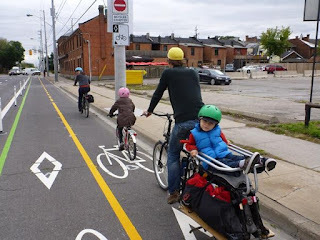 Do you want to help make Burlington the most cycling friendly city in Ontario. We're looking for new members! We need your ideas, your input and your passion to make our city better. If you want to make a difference, send me an email. 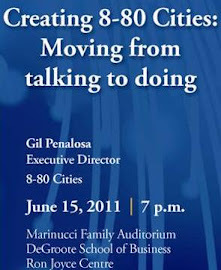 Make a difference, be there. 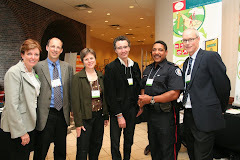 2010 Ontario Bike Summit - in Burlington! 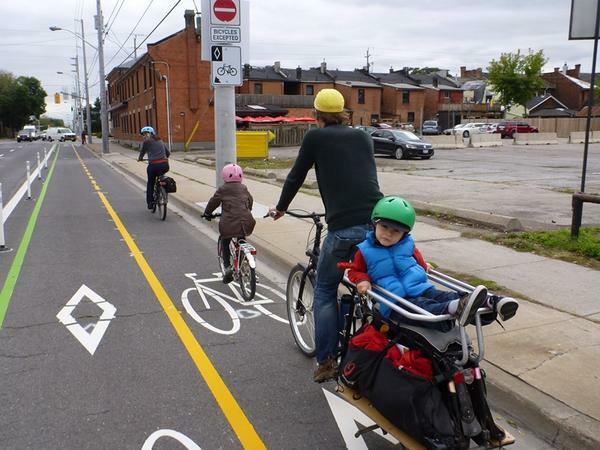 Mark your calendars, the 2010 Ontario Bike Summit is coming to Burlington Sept. 20-21. The event kicks off on Sept. 19 with a ride through Milton in memory of Sgt. Greg Stobbart. Cycling related speakers from around the world will be converging on Burlington to discuss best practices & ways to make it happen. You should be there! Time to think about getting in shape & support a great cause!! Coloured bike lanes are springing up everywhere. Boston, New York and Denver are the latest cities to adopt charteuse bike lanes. They are great visual guide for both motorists & cyclists and they are safer. So why aren't they in Burlington? 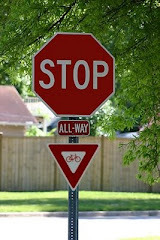 Many cyclists don't stop at STOP signs. They roll up to the sign, check the traffic & move through. Many, mototists do the same. In the state of Idaho, its legal to Roll With It. Hallelujah, the end is Here, the end is Here!!! Construction on Guelph Line has ended. Water mains have been replaced & now we have a continuous Guelph Line bike lane from Lakeshore to Prospect. Hallelujah! Wishful thinking. Who bikes to Walmart??? New bike lane on Fairview from Brant St. to the GO Station, in front of the new WalMart. The split picture also shows the FULL bike rack at the WalMart store! If we build it, people will use it. New bike lanes on Brant St. north of Fairview. Now you can cycle from Caroline St. to the QEW on new bike lanes. Lobbying from MEC made this happen. Thank you city hall associates & MEC. 1. 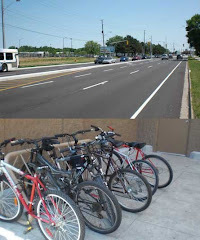 Guelph Line from Lakeshore Road north to St. Clair St. Road has been reconstructed & new bike lanes added. 2. Fairview St. from Maple Ave. to Brant St. - bike lanes have been restored. Between Maple & Brant, they've been restored. 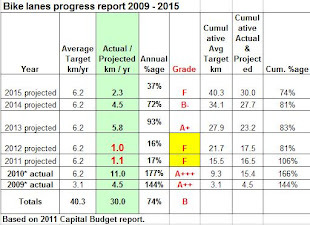 Unfortunately, the gap is due to width limitations. 3. Bike lanes running the length of Lakeshore Rd. Make it easier to get downtown.